One of the major benefits of the study of geomancy is the awareness of the power of divination. While I started my training in this field as a dowser (my mother first taught me over forty years ago), I have since learned that there are many different kinds of divination, and to choose to limit oneself to only one tool is, well, really limiting. Some dowsers limit themselves to not only a single tool, but, say, "Only Y rods made of apple will work!" If you believe it, it's true. If you don't, it isn't. Dowsing was my basic training, and I was taught by one of the best, Terry Ross, past President of the American Society of Dowsers, and one of the early dowsers speaking about leys in the US in the late sixties. From Terry I learned the importance of asking the right question to get the right answer - whom/what ever answers our dowsing questions takes us quite literally.Your analytical mind must be working quite well for your intuitive mind to come up with the best answer. When looking for a place to dig for water, you don't just ask, "Where's the nearest water?" You might well have water under the point where your dowsing tool indicates, but it may be nine-hundred feet down, yields two gallons an hour, goes dry between May and September, and tastes like dead rats! You need to say, "I am looking for the nearest source of good potable water to this home that is less than twenty feet down, and flowing year 'round at at least five gallons a minute." You have to ask the right question to get the right answer. Terry was the first to introduce me to deviceless dowsing, and well I remember his performances on the ASD stage in Danville, Vermont when he astounded us with his readings of the Earth energies under members' homes all over the US! I remember his eye going out of focus, and he'd look up and to the right, and the answers would materialize out of the ether. This awareness that one didn't need a physical tool at all was liberating, but I still take my cues from the physical world whenever I can. In the late sixties and early seventies I sought a more complex system of divination. I spent a great deal of time with the Waite-Rider deck of Tarot cards and assiduously studied astrology as used by the Order of the Golden Dawn as my method of understanding each card. The Tarot works, and is always on. It is only the reader's ability to read that can screw up the message. I learned that any divinatory system will work as long as it it is complete within itself. Tarot takes much more initial preparation to use effectly than dowsing, but then, it's more complicated. Actually, it takes to become good at any form of divination. Dowsing can work for you the first time you try it, but it takes years to become a master dowser. Somehow it has to get in to your system and become natural. Tarot also takes time in a different way. You have to initially learn meanings for each of the seventy-six different cards, and you have to develop a way to be able to see all seventy-six as related parts of the Whole. 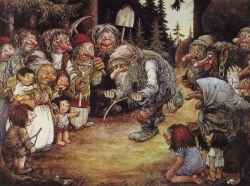 The Fool is the Pilgrim. Most people see as foolish, people who devote long periods of their lives walking long distances to go to some place known in history as being different and special on some kind of a quest where they come back with less money than they started! What a waste of time! Who is the Fool here? The Fool in the mediaeval court was the only person who could tell the King where it was at and get away with it. Only the wise man knows he's a Fool. This is the beginning of the Tarot journey, and the Fool serves the same function as the little different players one uses in the game of Monopoly. 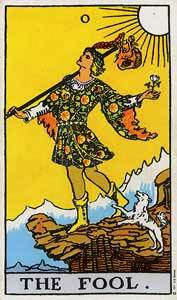 The Fool is you on your journey. On your Pilgrimage to the One. One could go on and on making more connections and spin-offs from the Fool archetype - the white flower shows pure intent. You gotta begin with that. S/he is paying no attention where s/he's going, and in fact is about to walk over a cliff, but God/dess takes care of Pilgrims. The point is to develop a number of associations one can make with each card which can then be used as key words in your divinatory story. Now about these key words. I believe that each of us has to develop our own key words for any given object - be it astrological symbol, tarot card, number, herb, I Ching symbol, tea leaf symbol, etc. Your own words. Listen to others, but in the end, go with the key words that resonate with you. The same is true for the card of Death in the Tarot. See the Grim Reaper marching to the setting sun (the death of day). In his slow unceasing march, all fall before him - Kings and commoners and clergy. It doesn't mean that every time you get this card that you are going to die - necessarily. 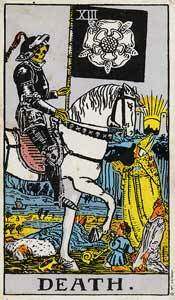 The vast majority of the time the card of Death means enormous significant, perceived as inevitable, change or transition. What in your life is at this point? Something significant in your life is going to die. Death is important here because something has to die to make room for the new. All change requres this. Some change comes easy, some comes hard. This is going to be a big one that you gnow (to know both rationally and intuitively) is inevitable. Things aren't always what they seem, and again, the interpretation is totally up to you. This verb "to gnow" is important here. Geomancers must have lots of facts at hand, and also have her/his intuitive skills well honed. Gnowing occurs when something checks out both rationally and intuitively, and the results of both are valued EQUALLY. Divination usually requires this method of functioning. The left brain has to ask the right question, and has to know all of the meanings and key words, say, in Tarot, of the cards. The right brain then takes these meanings and key words and applys them to the question. The Tarot taught me a lot by leading me in to such divers subjects as astrology, mythology, numerology, Mediaeval history and Carl Jung. Hell hath no fury like a recent convert, and I found myself at the beginning going to parties and saying, "Hi, my name is Sig. Can I read your cards?" Boring. I got over that, and the cards have served me well over the years - especially in counseling situations. These magical single path tools of divination were a gift to me from Jeff Saward, whom I met in at the first Glastonbury Earth Mysteries Gathering at Samhain, 1983. He taught me the miraculously simple way of drawing a classical labyrinth using its seed pattern, and gave me a wonderful initial boost in the study of this winding path - opposite of the straight energy leys I had studied for my Masters' Degree in the Seventies. In terms of divination, while I initially had amazing experiences in labyrinths, it was with the development of a system for walking the pathe that the power of these tools became apparent to me. Any divination begins with a question. Once you have that in mind, you can begin the divination process. One of the the best divination system I've found is given to us by Mother Nature Herself. I call them "Daysigns" - things that happen in the day that really catch your attention. Then treat this as if it were a dream. It can be anything Mother Nature brings your way from a cute little pesky squirrel carrying its nuts to a secret a secret store, to butterfly sitting on a daisy. For example,let's say you are thinking of going to Peru to deepen you study of Native people in the Western Hemisphere, and on your walk, you see an owlswoop by you while out on your walk, how would you apply that synchronous natural event to the question you have in mind? If your roots are in Europe, "Wisdom" might well come in to your mind. The wise old owl. So it is wise to go to Peru to continue your studies. Now, if you have Native American roots, you will interpret that owl completely differently. Owl means danger. Stay away! Each diviner muts develop their own code - one that works for and resonates with you. In your divination process, what you were thinking about just before something in Nature catches your eye can be clarified by your interpretation of that event. Let's say you had been wondering if you should quit your job and do something new. What does the squirrel putting away for later say to you in this situation? The butterfly on the daisy reminds me of it's connection with Air and the mental world. The daisy? "She loves me, she loves me not." Love seems to be a factor worth thinking about here. Plants are usefull allies when working with daysigns as they have medical and magical connections that can be applied to your daysign walk. Maple is sweet, Mountain Ash, or Rowen, is protection, dock is a remedy to getting stung by nettles. What's nettling you? (Puns actually seem to be very significant tools in this process. The Four Directions can be the stage where Daysigns can be played on. Each Direction has meaning - again, totally up to you. For me, East is where the day begins, that first slash of an idea. South marks the brightest time of the day in the physical world, so the spiritual world in the North is at your back. You have to take that spiritual world on faith and trust that it is there. West has to do with the end of the day and the conclusion of projects. Transition. North, in the darkness, is Wisdom. What would it mean if that squirrel was putting away his nuts to the North of you? (I'm assuming here that you know where North is.) Perhaps it might be wise to put away a bit more cash in the bank before moving on to a new job. Numbers are always a part of divination. Each number has its own meaning - for you. You see 2 butterflies dancing in the air to the west. You better think twice before leaving this job! Three black crows always mean TO ME that the triune Goddess (Virgin, Mother, Crone) is present. How does She figure in this decision? How would four swans flying in the East effect your thought about leaving your job to do something new? For me, 4 is the number of physical manifestation. Standing four square. Swans (love) in the air (mental/thinking) about the East (new possibilities). Prospects for leaving your job and manifesting a new one that you will love that will be mentally more challenging are literally in the air! In addition to all of the other tools they have in their bag (straight edge, pair of compasses, magnetic compass, clinometer, etc., geomancers need these kinds of divinatory skills. When you are out in the field, intent on finding the best place for a client's healing center, Nature will speak to you in many ways if you can only open up your senses to what She is saying. The same could be said of divination as a whole. Divination is an integral part of what we call modern European Geomancy.